From left: Amarjit Singh, Dewan Chand Maharaj and Pushp Chand with the $12,000 cheque in Suva yesterday. The Kidney Foundation of Fiji received a $12,000 cheque donation from Island Safety & Civil Limited yesterday at the centre in Suva. The donation will go towards buying more medication for patients, which will supplement the expensive dialysis treatment that many patients could not afford. 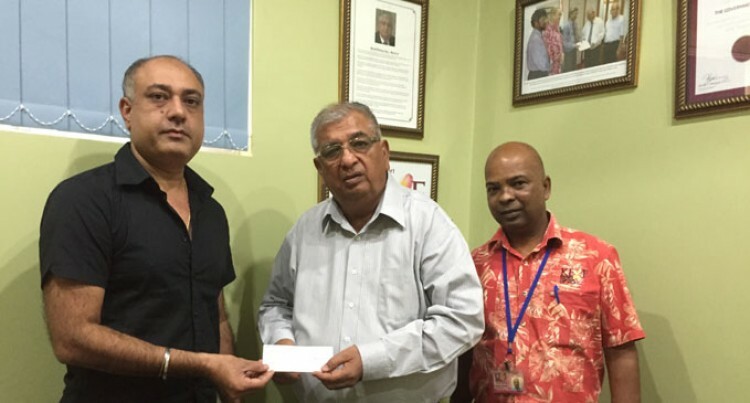 The president and founder of the Foundation, Dewan Maharaj, said Fiji has become a diabetic hub. “Fiji’s 1/3 population is diabetic which leads to kidney failure,” Mr Maharaj said. There were 60 kidney patients in total around the Pacific who were treated at the centre this year. The youngest kidney patient was aged 7. Mr Maharaj said senior citizens mostly suffer from kidney failure because of their deteriorating body condition or health and sometimes can be caused by pneumonia. “The younger generation that gets kidney problems today is mostly born with a defective kidney from the mother’s womb,” he said. The Kidney Foundation of Fiji has treated 300 patients since 2012. Age is no barrier to kidney problem and therefore we should eat the right food at the right time, cut down on alcohol and most importantly cut down on the consumption of kava. “We have saved 60 patients last year and this year we saved around 30 patients who were admitted to Intensive Care Unit, which is the last place for all serious cases,” he said.